Three comrades and many others are still in jail, under house arrest or facing charges relating to the G20 in Toronto, including Ryan Rainville, Kelly Pflug-Back, and Byron Sonne. Six of the 17 people facing conspiracy charges stemming from the G20 have pled guilty, and the other 11 had their charges withdrawn. Sentences for the six charged are expected to range between six months and two years. "There is no victory in the courts. The legal system is and always has been a political tool used against groups deemed undesirable or who refuse to co-operate with the state. It exists to protect Canada’s colonial and capitalist social structure. It is also deeply individualistic and expensive," reads a statement put out by the 17 so-called conspirators when they announced the plea bargain. New documents showed that the infiltration in activist communities in the lead-up to the G20 constituted the largest police spying operation in Canadian history. 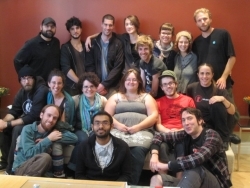 Folks participating in Occupy actions in London, Halifax, Regina, Victoria, Toronto, Edmonton, Vancouver, Ottawa and Montreal were forced out of the spaces they were holding, while Occupy camps remain in Calgary and Winnipeg. In many cities where permanent camps are no longer being held, regular General Assemblies continue. In Canada, a group of Mexican farmworkers filed a suit against the federal government seeking damages after their contracts were broken. Canada's chief of defence staff travelled to Qatar to discuss the continuing occupation of Libya. Though the NATO military operation has ended, the oil has begun to flow again, and companies including Alberta-based Suncor are reported to be planning their return to Libya. The Department of National Defence posted a document online seeking a private US security company to train Canadian soldiers who will remain in Afghanistan. The contract "tests the Conservative government’s assurance that the more than 900 soldiers involved in the 2011-2014 training mission would be operating largely out of harm’s way," according to the Toronto Star . Meanwhile, Afghan officials said six children were among seven civilians killed by a NATO bombing in the country's south. In Pakistan, an attack attributed to NATO killed 24 soldiers at a checkpoint. Ontario's Royal Military College (RMC), Kingston, offered an honorary Doctorate to hockey commentator and war-mongerer Don Cherry. “On many occasions he publicly expressed his contempt for many groups of the Canadian population, notably for the French-speaking Canadians, for the [lesbian, gay, bisexual and transgendered] community and for the immigrants,” said RMC professor Catherine Lord. Cherry later declined the offer. Defence Minister Peter McKay met with Ehud Barak, Israel's Minister of Defence in Ottawa, and hyped up increasingly strong Canada-Israel relations. “Canada and Israel have enjoyed close bilateral defence relations for some time and our special relationship with Israel has grown stronger in recent years,” said Minister MacKay. In addition, over the past month Canada moved even closer to Israel in several United Nations votes. An Irish organization began recruiting 10,000 people to participate in mortgage strikes, or in a refusal to pay mortgages with unfair conditions. "It is radical but it is where we are going if things don't change," said Ross Maguire of New Beginning, a kind of trade union for Irish mortgage holders. 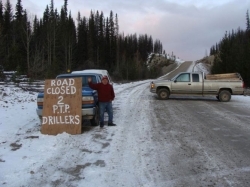 In occupied British Columbia, folks from the Wet'swet'en and the Tsilhqot'in nations mobilized to keep oil and gas and mining companies off their territory. "We will fight what is happening in the Alberta tar sands and what is happening to their aquifers and we will also fight plans to destroy the aquifers on our side of the Rocky Mountains," Toghestiy, hereditary chief of the Likhts'amisyu clan of the Wet'swet'en, told the Vancouver Media Co-op via email. Supporters and Indigenous land defenders held a protest in Vancouver, and did court support alongside the Tsilhqot'in. A decision from the US government that would allow the Keystone XL pipeline to proceed was delayed. The reprieve is a temporary victory for environmental activists, who mobilized en masse against the pipeline this summer. Presenters at an oil and gas conference in Houston, Texas, were recorded recommending that their colleagues learn about counterinsurgency as a means to fend off protests against industry. "...[H]aving that understanding of psy ops in the Army and in the Middle East has applied very helpfully here for us in Pennsylvania,” said Matt Pitzarella, director of Range Resources corporate communications. Otto Perez Molina, a retired army general, was elected President of Guatemala in a run-off election. He promptly named an ex- Kaibil (member of Guatemalan special forces accused of the atrocities during the country's 36-year internal conflict) as Minister of Defence, and announced that he would use the Kaibiles to fight the Zetas, an organized crime group that originated along the US-Mexico border. Meanwhile, Quattro Resources, a Calgary-based oil company, announced it has acquired an 80 per cent stake in a 554,000 hectare exploration project in Guatemala's northern Peten province. Violence continued to spread throughout Mexico, as 26 bodies were discovered in Guadalajara, the country's second biggest city. The killings follow the arrival of 11,000 police and soldiers to the city for the Pan American Games. In Brazil, military police staged invasions into the Favelas (shanty towns) surrounding Rio de Janeiro as part of a campaign to "pacify" the poor areas of the city before the 2014 World Cup and the 2016 Olympics. A group of athletes in India pressured the Indian Olympic Committee to boycott the London 2012 Olympics because Dow Chemical is a prominent sponsor. "We feel that it will be against the basic principles of the Olympics charter to partner with Dow Chemical, which is responsible for the ongoing disaster in Bhopal," reads a letter from the athletes, obtained by the Guardian . Anti-nuclear activists in France fought with police after blocking a shipment of recycled uranium headed for Germany.